I have a ridiculous career. A little over nine years ago, I started The Cocktail Chronicles as a way to document and keep track of my experiments and explorations of cocktails — and, with fingers crossed, as a way to build up a portfolio of my drinks-related writing that might, someday, lead to paid writing gigs. 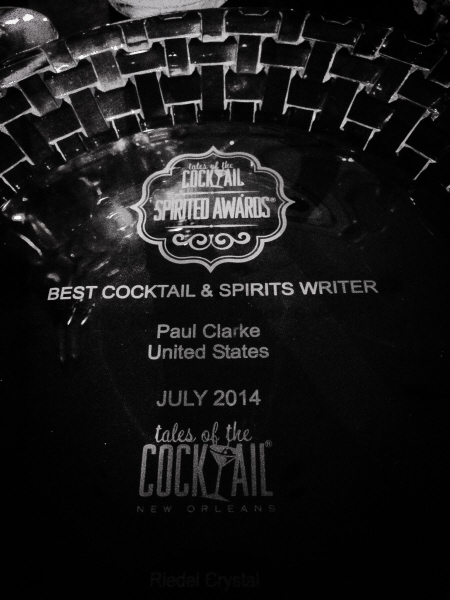 On Saturday, I was honored to receive the “Best Cocktail & Spirits Writer” Spirited Award at Tales of the Cocktail. This award capped a 12-month stretch that included taking on the role of executive editor at Imbibe (and I’d be remiss not to mention that right after my award was presented at Tales, Imbibe took the title of Best Drinks Publication), receiving an award from the International Association of Culinary Professionals for drinks writing (for an article about Martinique and its rum that appeared in Imbibe), and passing the milestone of writing my 1,000th published piece related to spirits and cocktails (including posts on The Cocktail Chronicles, the nearly 400 pieces I wrote for Serious Eats over the years, and the scores of articles I’ve written for a long list of magazines, newspapers and websites). None of this could have happened if a few folks hadn’t read those early posts and responded in a favorable way, encouraging me to keep writing and to take what started as a hobby and turn it into a career. I’ve lost touch with some of those early readers — my first commenter was “C” at Slakethirst, a long-defunct drink blog based in Portland, who astonished me not only with his helpful suggestions, but with the realization that somebody had actually *read* the stuff I was posting — but many others?I still see or hear from via Facebook on at least a semi-regular basis. Gradually, as word got around that some lunatic was posting old drink recipes and commentary online (at least in those early years — this blog has grown a bit dusty with disuse), I was surprised to come across bartenders, distillers and other writers from around the world — as well as a vast number of civilians who simply enjoy a good drink — who had strayed across the Cocktail Chronicles, and stuck around to see what else I might do. Today I’m humbled and honored by the recognition I’ve received, and raise a glass in tribute to all who’ve encouraged me to keep going. And as for this blog, and the future? I’ve all but abandoned this site in recent years, as my day-to-day work of writing about drinks has supplanted the blog’s original role. But I’ve had another piece of luck come my way in the last 12 months, one I’m not quite ready to share publicly but that I promise to announce soon. The Cocktail Chronicles played a big role in that piece of good fortune, as well, and this will be the primary outlet for me to announce the project, and to more fully explore this grand world of drinks that’s been so good to me for almost a decade. Anyway, thanks, everybody — I appreciate all the support over the years that has?made this ridiculous career of mine possible.